I have been campaigning for years against the destruction of the Colne Valley wetland nature reserves which are essential for the health and well being of our local communities and future generations. My name is Sarah Green, I run the passenger boat along the Grand Union Canal in the beautiful Colne Valley floodplain in West London. Here are kingfishers, dragon flies and barn owls, part of the web of life that is being annihilated by HS2. I have been charged with aggravated trespass for taking action to stop the destruction of the wetlands. If you believe in protecting our fresh water ecosystems against destructive development, please support my legal defence by contributing now and sharing this page with your friends, family and on social media. Under the surface of our wetland nature reserves lies the Mid Chilterns Chalk aquifer which provides 3.2 million people with fresh drinking water. This is now under threat from multiple HS2 activities such as pile driving into the aquifer. On December 11th 2018 HS2 contractors started work on a new Load Test Pile Compound in Harvil Road. The Newyears Green Bourne runs along the edge of the field and is already a pollution pathway as upstream is a contaminated landfill responsible for closing the Ickenham Water Pumping Station. HS2 has not published ‘risk assessments’ for the aquifer or surface water bodies and shown no sign that environmental permits are in place. 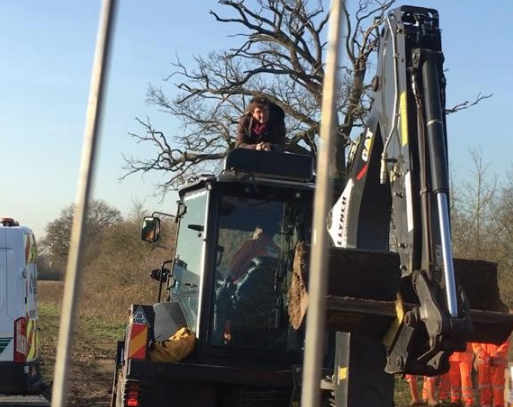 When no one from HS2 would address our concerns some of us entered the site. We were told we had broken the High Court Injunction and I was arrested and charged with Aggravated Trespass. This is a criminal charge that amounts to obstructing ‘legal activity’. Our defence challenges HS2's 'lawfulness' and seeks disclosure of ‘risk assessments’ for safeguarding our Public Drinking Water supplies compromised by HS2. We are raising £5,000 with a stretch of £26,000 for a legal team with expertise and winning track record in protecting drinking water. My barrister has previously won record compensation against corporations in the Water Industry. It is essential that HS2 does not do more harm than good. This case can make a huge difference as UK and EU law protects Public Drinking Water supplies. The case was again adjourned on April 1st 2019 to the 17-18th July 2019, at request of the prosecution. We need your support: please contribute and share this page now! Proud to support an environmental protection hero. I wish I could keep back 20% of my tax to distribute how I want to keep vital resources free. This is so important - yet another hot news story smothered by the squid ink of brexit.